A research team has found that distressed neighborhoods where vacant lots have been converted into small parks and community green spaces are associated with reduced crime when compared to neighborhoods with unimproved vacant lots. The study was conducted by a group from the University of Pennsylvania's Perelman School of Medicine, using Philadelphia data compiled over the last decade. In some sections of the city, residents of neighborhoods with improved vacant lots also reported "significantly less stress and more exercise," suggesting that the improvements had an effect on residents' perceptions of safety outdoors. This program involved removing trash and debris, grading the land, planting grass and trees to create a park-like setting, and installing low wooden post-and-rail fences around each lot to show that it was cared for and to deter illegal dumping. Several times a year, PHS returned to each greened lot to perform basic maintenance, such as mowing the grass, tending trees, or repairing fences. [Penn's Dr. Charles C.] Branas and his team analyzed the impact of this program for a decade, from 1999 to 2008, using a statistical design that considered various health and safety outcomes and numerous other factors occurring on and around vacant lots, before and after they were treated, as compared to vacant lots that were not greened over the same time period. A control group of unimproved vacant lots was selected with a methodology designed to ensure fair comparability to the greened lots. The study, which was published earlier this month in the American Journal of Epidemiology, correlated the lots with data from the Philadelphia Police Department and the Southeastern Pennsylvania Household Health Survey. 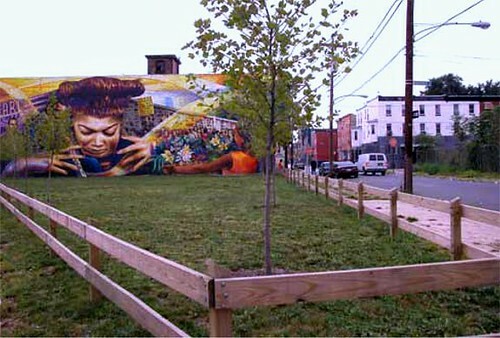 Vacant lot greening was associated with significant reductions in gun assaults across all four sections of Philadelphia in the study and with significant reductions in vandalism in one section. Greening was also associated with the reporting of significantly less stress in one of the sections of the city and with more exercise in another. Cholesterol numbers were lower to a statistically significant degree for the greened areas across all four city sections. A greened lot may serve as a new opportunity for community gatherings, bringing large groups of people together and increasing the opportunity for crowd-based nuisance crimes such as disorderly conduct, say the researchers. Community interest in maintaining a newly greened lot may have also increased calls to police and arrests for disorderly conduct. An earlier, smaller study conducted by researchers from Texas State and Texas A&M, and reported two years ago in Science Daily, was unable to find a statistically significant correlation between eleven Houston neighborhoods with community gardens and reduced rates in reported crime when compared to a control group of neighborhoods without gardens. Even that study, however, found that the residents of neighborhoods with gardens "linked the presence of the gardens to ... perceived immunity from crime, noting changes such as the cessation of illegal activity, including dumping and/or drug activity, increased property values, and increased neighborhood redevelopment." The Texas researchers also noted that other studies have revealed an increase in the number of owner-occupied dwellings, more personal income (as a result of attracting people with higher incomes to the community), and rent increases in areas surrounding community gardens. The Philadelphia team noted that a range of studies have shown that the presence of urban green space is linked to lower rates of mortality and health complaints and to mental health benefits. My take is that it undoubtedly takes more than increased, tended green space to cure crime and other problems associated with distressed neighborhoods and vacant lots. But I suspect we are also seeing the beginnings of evidence that it is among the things that can help.